From this you may think we have kids... which we do not. What we do have are friends with kids and two spoiled dogs. 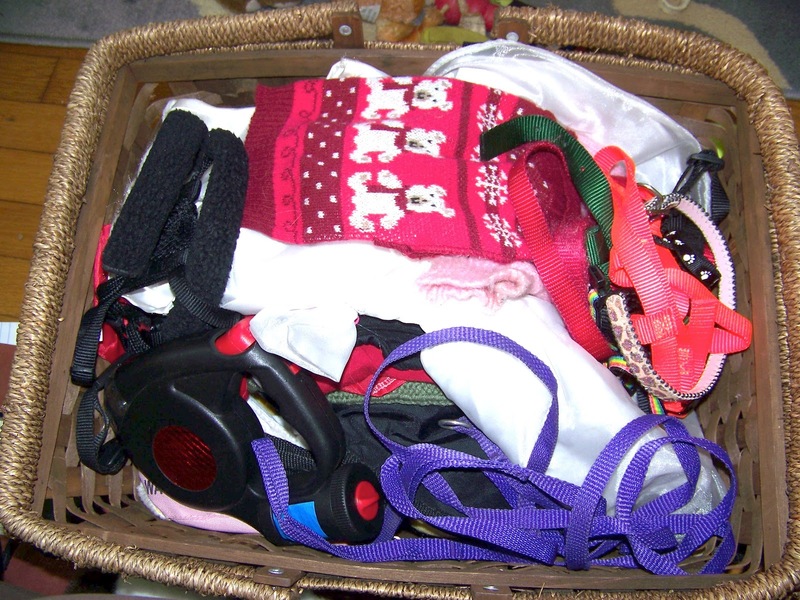 Everything on top of the table are toys that entertain our friends kids when they are over and in the baskets are our dogs toys and leashes and sweaters and anything else of theirs that we can stuff into these overflowing baskets. I decided to tackle the dog baskets by first pulling them out and paring them down. 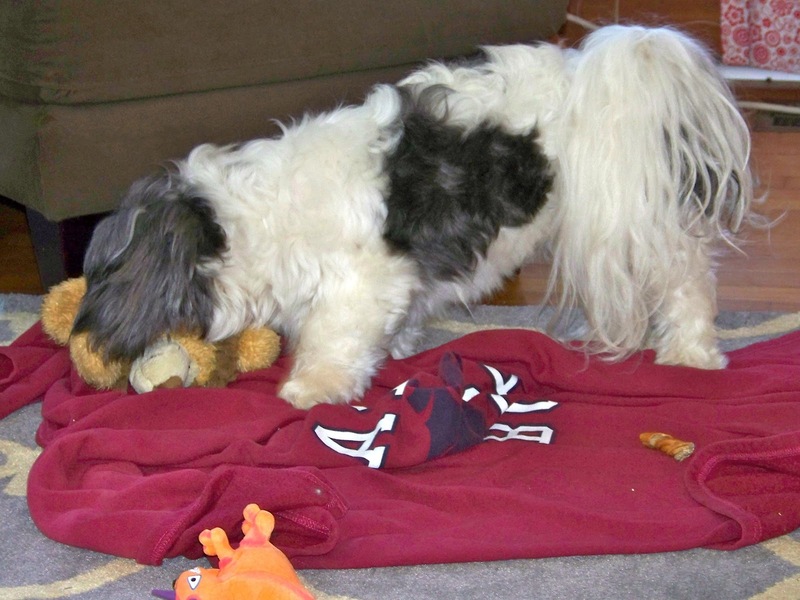 As you can see the dogs were already going nuts over a long lost toy. I decided to basically let the dogs decide which toys to keep. 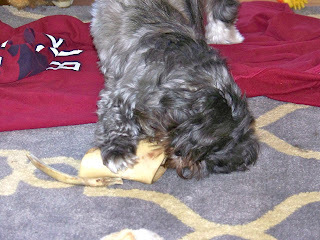 While our dogs don't have the best decision making skills, they have their favorite toys down pretty well. 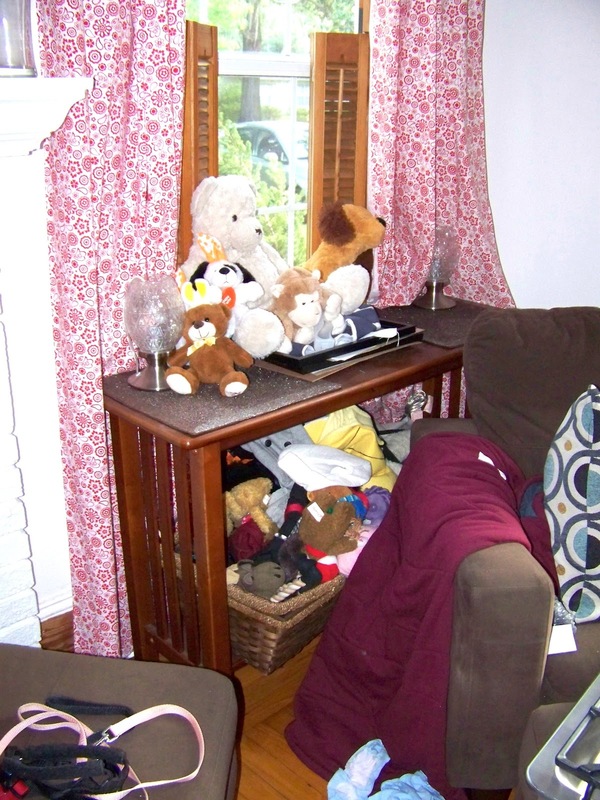 I basically went through the toys one by one and offered it to them. If they didn't take it, I put it off to the side. I left the pile out for a few hours and only one of those toys got pulled out so they rest went away. Weird concept, I know, but I figured if they wouldn't take the toy, they wouldn't play with it. As you can see, Zoe apparently thought my process was a little too slow so she snuck over and grabbed one of her fav's right out of the basket. 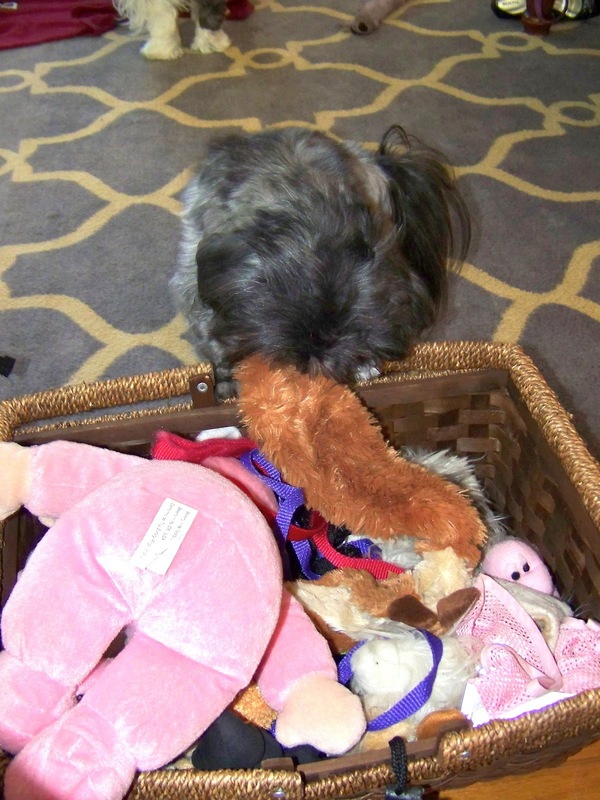 One of the reasons this was such a slow process was that our dogs hadn't seen the contents of their baskets in awhile so with every new toy there was an obligatory play period before I could get their attention back for the next toy. 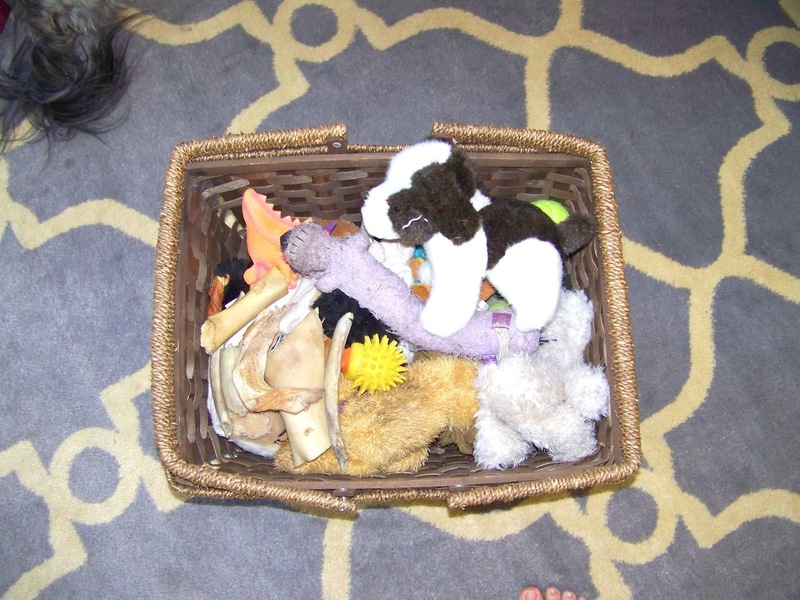 And so while they were playing, I went through all the rest of their non toy paraphernalia and weeded out any old/worn out/broken things and put everything back in one of the baskets. 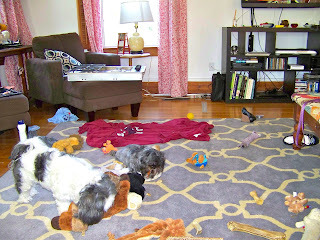 By the end of this process, our living room floor was strewn with toys and the dogs were exhausted. I had to get them a second bowl of water because they were panting so hard! It was quite the struggle to get all the toys into the other basket since the dogs kept taking toys back out, but finally all but two (one each as a distraction) made it in the basket and they all fit! 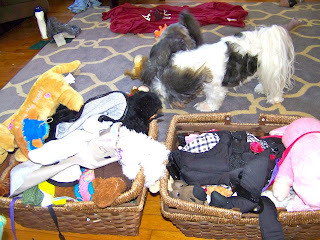 I moved the table and baskets into the front hall where the dogs can access the toy basket a little better (Zoe jumps into the basket and throws out toys until she gets the one she wants). 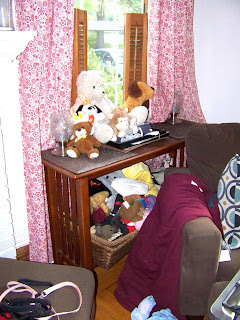 The kid toys went into a big basket I had with our blankets over them so they are put away most of the time but can easily come out when friends come over. The dogs have been surprisingly content with just a few toys out so I think every couple of weeks I'll switch out the toys so they keep thinking they are new and we can go awhile without buying new toys! 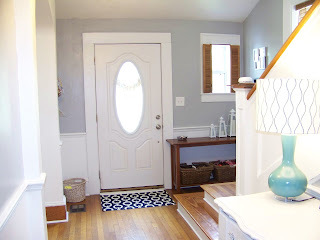 I am loving the neater dog area and even more, I'm loving the fact that we can find the leashes without a 30 minute search! Quickly Toddler Proof the Toilet Paper!